Kpreps.com would like to congratulate Cheri Ricke for submitting the winning photograph for Week 10 of the Kpreps Friday Night Photo Contest. 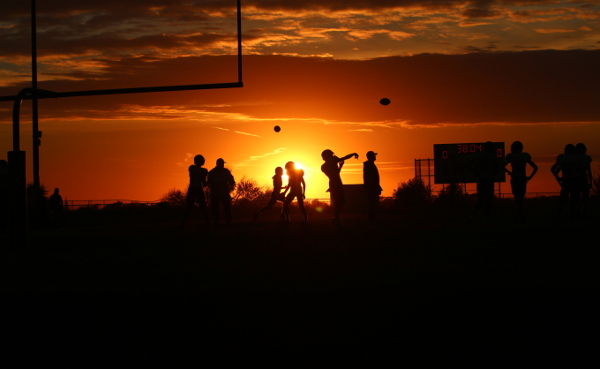 Cheri’s photo captures players warming up in front of an incredible sunset prior to the second-round playoff game between Argonia-Attica and Udall. Argonia-Attica went on to win the game, 42-36, to advance to the state quarterfinals. Udall had defeated the Titans, 22-14 during their regular season matchup. With this winning photo, Cheri is eligible for our 2018 Grand Prize including $500 in cash.